Who's ready to see Claire and Jamie in the bath?! 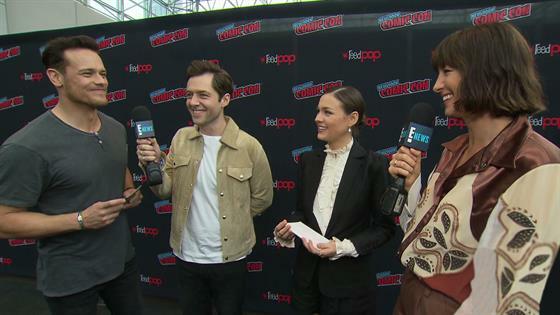 That's apparently what we're in for, according to a little song Caitriona Balfe sang when we met up with the cast of Outlander at New York Comic-Con and had them ask each other to spill some secrets about what's to come in season four. Asking for Jamie and Claire scenes specifically resulted in Balfe singing about bathtime, which also resulted in Sam Heughan going, "Oh, God yes," which means we actually don't need to know anything else and we are all set for season four to start right about now. Since it's still almost a month away, however, we'll take whatever other teases this cast has got for us. Claire and Jamie coming to America? Yes. Brianna and Roger getting closer? We'll take it. Roger...meeting the parents? While that was Richard Rankin hypothetically being "hypothetical," we will take that as well. But what if Claire & Jamie and Roger & Brianna were to go on a double date? "Bowling," Balfe offers as an activity, before turning to Sam. "You and Richard could wear the same jacket." Turns out Rankin had dressed in almost exactly the same jacket and t-shirt combo that Heughan had worn the day before at PaleyFest. "Richard came dressed as me today," Heughan explained. "I just thought I was so inspired by you yesterday and what you were wearing, I was thinking, I wonder if I can pull that off," said Rankin. Click play above for more from these (mostly) Scottish time traveling goofs, and then come back tomorrow for more, including some explanations for a few of the references in this video. You will not want to miss discovering which American foods may tear the cast of Outlander apart.